When designing a log home, there are several criteria to keep in mind that will help determine the effectiveness of a home design for both efficiency and satisfaction. Everyone appreciates segregated areas planned for entering and circulating through the home, relaxing, and entertaining, looking and eating, sleeping and bathing, and outdoor activities. Storing possessions is also a real challenge. Organizing these areas is one of the most important concepts of home design. Closed Plans - Divide space into sharply separated rooms. When heating was difficult and low building costs permitted many rooms for specific purposes, closed rooms functioned well. Open Plans - which have fewer walls and minimize the separateness of areas used for relaxation and entertainment, eating and cooking. Relaxation and entertainment suggest large spaces and furnishings adaptable to varied situations. Living and dining spaces that permit many different furniture arrangements can be changed to suit the family, the occasion or the season. Large doors that open onto porches or decks unite the spaces with the outdoors and enlarge the living areas. A family room nearby also extends group entertainment space, but one at some distance allows two groups to gather independently. The preparation of food does not have to be separated from the rest of family life. In many homes, the kitchen opens into the great room over a counter or left open. This not only facilitates serving informal meals but gives those in the kitchen a pleasant view and an opportunity to observe others and interact. Dining area can be varied. They can be at one end of the Great Room, in one leg of an L-shaped living-dining space, or in a totally separate room. Convenience is greatly increases, however, if it is located near the kitchen. Bedrooms need privacy, good ventilation and quietness. In one-story homes, they are usually grouped together in the quietest part of the home, sometimes in a segregated wing. Children's and adult's bedrooms can be separated in the home to give privacy to each age group. You can have the center of the home where your Great Room, Kitchen, and Dining areas lie and have 2 wings off those areas with a master Suite on one side and the kid's bedrooms in the other wing. In the typical two-story home you may find all bedrooms are on the upper floor away from other activities, but placing bedrooms on more than one floor also has advantages, especially when children are older and need a degree of independence. Bedrooms that can double as studies or retreats are particularly useful. Bathrooms should be placed to suit each family's needs. It is desirable to have at least one centrally located on each level, in addition to any accessible only through the bedroom it serves. Laundry rooms located near the kitchen or bathroom consolidates plumbing and is also placed for convenience. Storage is a major concern today when there are so many things to be put away in limited space. Convenience indicates that objects be stored near where they are to be used and that each object be easily available. Homes need adequate cabinets in the kitchen, large closets in the bedrooms, pantries, and drop zones by the entry. Proper planning ahead of time can save you in costly renovations down the road. Ready to start planning your dream log home? 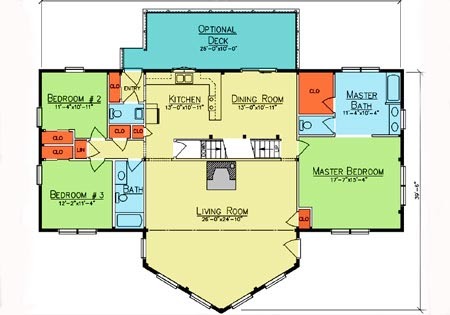 View our floor plans or give us a call at 800-341-1566 to discuss the possibilities. Or drop us an email.